Transitioning from being an expert speed skater to an expert speaker has been an interesting ride over the last 10 years. Steven has presented at over 750 conferences and events in 15 countries and still loves it. He loves the adrenalin before going onstage and loves that his strategies for success in business and in life are able to inspire and help people. Steven Bradbury’s remarkable and unlikely victory at the 2002 Salt Lake City Winter Olympics was achieved after a spectacular final-lap spill took out his four rivals. Bradbury threw his arms up in disbelief and smiled as he crossed the finish line. His gold medal win was not entirely as fortuitous as many would believe. Bradbury knew his limitations and also the unpredictable nature of short track racing. Half the battle is staying on your blades, and Bradbury did just that, right when it really counted. Dubbed ‘the luckiest gold medallist’, Bradbury won fans the world over for the honesty and humility he showed after the win. He saw his victory as reward not for one race, but for a decade of hard slog that has included more than his share of misfortune. In Norway, 1994, a race accident led to him being impaled on a skate and creating a cut so extensive he lost four litres of blood and required 111 stitches. He was extremely lucky to survive. A training mishap in 2000 broke his neck and forced him to spend six weeks in a halo brace. Steven Bradbury again fought his way back, and two years later that neck was in the headlines again – only this time it was supporting an Olympic Gold Medal. 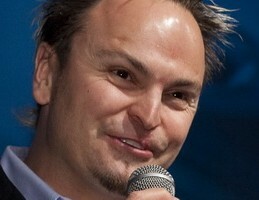 In addition to his motivational and inspirational ability as a corporate speaker, Steven Bradbury also brings sound business principles learnt through running his own company RBC Revolutionary Boot Company, which makes specialised skates and cycling shoes. Just as in sport, Steven believes there are two factors to his success. First, you need the determination and resilience to put in the hard work required and ensure your preparation is complete. Second, you have to take a risk. At RBC, and in Steven’s speed skating career, he took many chances. Some worked, some didn’t. However, he stuck at them and today he has an Olympic gold medal and RBC export custom speed skates and cycling shoes to 19 countries around the world. For key topics including: motivation, inspiration, success, strategy, positive mindset, leadership, entertainer, celebrity, athlete, MC and facilitator, Olympic Gold medallist Steven Bradbury is a great addition to any event.